Just like the aforementioned Ally, the Axis features a 3.2-inch WVGA (800x480) display as well as a 3.2 megapixel camera and... wait for it... Android 2.1 (Éclair). One might think that with specs such as these, the device would be free on contract; but alas, the Axis is now on sale for $89.99 after a $50 MIR. Sad, isn't it? LITTLE ROCK, Ark. 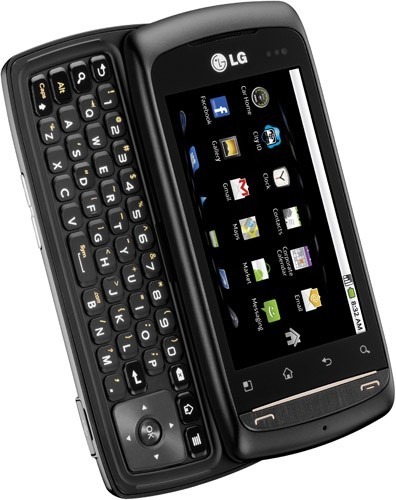 - Alltel Wireless and LG Mobile Phones today announced a new smartphone, device, LG Axis™. Versatile and sophisticated, LG Axis offers Alltel customers a Google™ Android user interface, customizable applications and entertainment experience that will keep users effortlessly connected to the things that matter the most, wherever life may go. Equipped with Google™ Android 2.1 and access to the Android Market™, LG Axis provides users with more than 80,000 applications for music, games and other entertainment categories. LG Axis also allows users the ability to customize up to five different home screens by adding or removing shortcuts to their favorite applications and widgets, creating a unique phone that is tailored to meet their personal needs. "Alltel Wireless is excited to offer a versatile, feature-rich smartphone with superior capabilities," said Scott Moody, Alltel Wireless Vice President of Products and Services. "LG Axis allows you to navigate through multiple screens with a simple touch or utilize the slide out keyboard for quick, accurate messaging." Along with a speedy user interface, LG Axis includes Google Maps™ Navigation with voice-aided, turn-by-turn directions and a 3.2 megapixel digital camera and camcorder with a 4x zoom. The smartphone is also Wi-Fi enabled, giving customers two ways to connect to the Internet – through Alltel's fast 3G wireless network or through any available Wi-Fi hotspot. "LG Axis provides consumers with an easy-to-use Android device that complements busy schedules and growing mobile entertainment needs," said Tim O'Brien, vice president of marketing for LG Mobile Phones. "Allowing users to quickly download a wide variety of content and applications, LG Axis creates a customizable experience that will enrich everyday activities and streamline life's most demanding tasks." - Bluetooth® wireless technology for a hands-free experience or to easily transfer data to a computer. - Multi-function usage that allows customers to play music in the background while sending messages or surfing the web. LG Axis is available at Alltel Wireless for only $89.99 after a $50 mail in rebate and a two year service agreement. Alltel Wireless continues to be an industry leader, providing customers its exclusive "My Circle" feature – unlimited calling to and from any 5, 15 or 25 numbers on any network as well as unlimited text to their circle on select plans. Alltel Wireless was also the first to offer Anytime Plan Changes, giving customers flexibility to change their calling plans at any time without extending their contract. Now with "Free Fridays", new and existing Alltel customers who sign up for a qualifying rate plan will now receive unlimited free calling on Fridays.